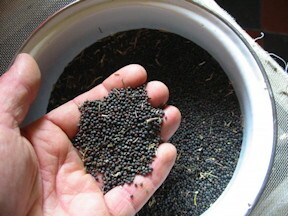 All seeds need warmth and moisture to germinate and grow on well. How much warmth varies by type of vegetable – for example broad beans will grow fine in soil temperatures over 8 degrees C, whereas aubergines need much more heat; ideally over 24C. The table below shows the minimum and preferred temperatures that different types of seed need to germinate. While seeds will germinate in the cooler conditions, they will come on more slowly and be more inclined to rot, damping off and other ills. So, you can see that french beans will start to germinate from 8-10C, but ideally need much warmer temperatures – between 16-30C is ideal. Remember that the soil temperature is not the same as the air temperature; the soil warms up more slowly in the springtime. Typically soil temperatures only get over 10C from mid May, and over 15C from mid June. Equally, don't cook your seeds -anything much over 30-35C can kill them. This might not seem like much of a risk in a British spring, but covered trays in closed up greenhouses can get very hot very quickly on a sunny day. Early in the season, greenhouses are also often much colder than people imagine. We get a lot of calls in March and April from people who have sown tomatoes, peppers and aubergines in their greenhouses or on a windowsill, and are wondering why they haven’t come up. So, does this mean that you can only grow these tender crops if you have an electric propagator and a heated greenhouse? No – definitely not. But you do have to be a bit creative, and think about the ways in which you can give them the warmth that they need. Luckily, all three of these crops will grow on at cooler temperatures once they have germinated. So, if you can keep them warm and damp until they get started, you should be fine. If you have an airing cupboard, this is ideal. Sow your seeds in small pots, and wrap them loosely in a plastic bag. You want to keep them damp (and keep the compost off your washing), but not airtight. Put them in the airing cupboard, but do remember to check them every day. It is very important to get them out into the light as soon as they start to appear. Cucumbers and melons are also ideal candidates for starting in the airing cupboard, and again they will grow on fine at cooler temperatures on a windowsill or a greenhouse once they have got going. Lots of gardening books suggest that these crops can be started direct outside in the garden. This may be the case in a good year, if temperatures stay warm and if you don’t have any problems with mice on your plot. We find we get much better results if we start them off indoors and don’t put them out until they’ve got going – bigger plants are also more likely to survive any slug attacks. We soak our beans for a few hours in warm water (around 25-30C), then either plant them in standard seed trays, with 24 seeds to a tray or in larger sized modules. 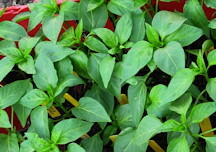 They can either go in the greenhouse, if you have one, or alternatively they’ll germinate fine on a sunny windowsill. As soon as they come up, put them outside to harden off in the daytime, just bringing the trays in at night, then plant them out in the garden as soon as the first true leaves are full size. Squashes and courgettes need warmer temperatures than french or runner beans to get going. Again, you can put the pots in the airing cupboard, and then bring them out into the light as soon as they start to germinate. Start hardening the plants off as soon as the second true leaf has opened, and then plant them out once they have two full sized true leaves, and the third one is just starting to open. If you have a problem with mice, you may find peas and broad beans are difficult to get going, simply because the seeds get eaten before they have a chance to germinate. Fortunately, the mice don’t seem to be interested in seeds that have started to sprout. Rather than start all of our peas and broad beans in trays, we find that we can get away with simply pre-sprouting the seed on a thick layer of damp kitchen towel, then carefully planting them out as soon as the root starts to show. Ideally they should go into the ground before the roothairs have started to develop. This works best for us once the soil has started to warm up a bit in spring, say from around mid April. Mice also like french bean, squash, courgette and cucumber seeds, so unless you are certain that your greenhouse or polytunnel is rodent free, these crops are also best started off safely inside the house.